Redesign again… help me put a new face on DBCII! Hello! It’s been a while. As I mentioned, it was time to move the Weekend Coffee Share posts over to Comparative Geeks, where they have been going well. And I moved the photo blogging to Instagram, where I’m already up to 115 followers – and where I am working on a sketch a day for October. So then the hard decision kept coming up here on WordPress: to renew or not renew my domain here for DBCII. I finally went ahead and did, but that means this needs a purpose. So that means a redesign. 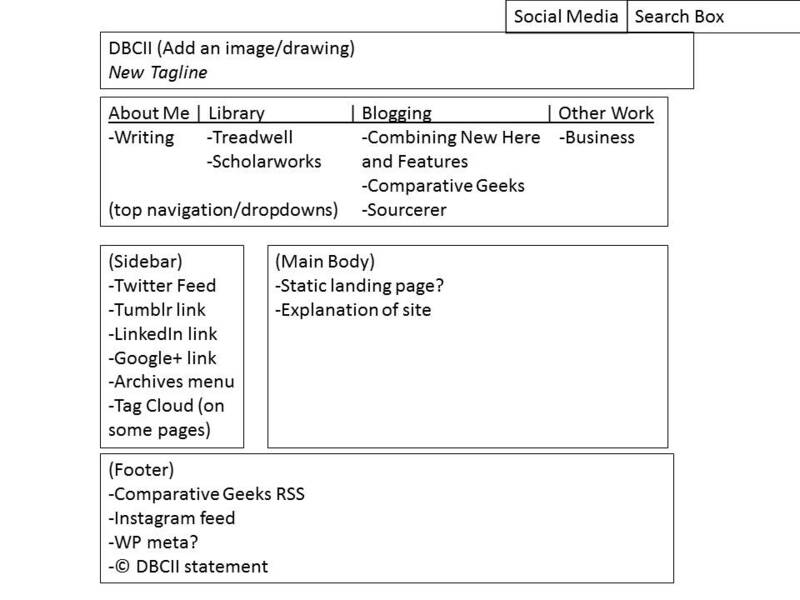 I have been using a wireframe like this to consider web design for a while. The Information Architecture class I took in my library science degree really has come in handy! What do you think? There are some items that I could showcase that I am not here. Instead, there’s a lot of dreaming and hoping here. I can tuck that away and leave the finished and ongoing projects. Does this make sense and look good? Anything you think I am leaving out for it to be an e-portfolio? Let me know in the comments!